After being released from the Golden State Warriors following last night’s win, Briante Weber will reportedly sign a 10-day contract with the Charlotte Hornets, reuniting with former VCU class of 2015 teammate Treveon Graham. Warriors free agent Briante Weber has agreed to a 10-day contract with the Charlotte Hornets, league sources tell @TheVertical. Weber was signed to two 10-day contracts with the defending Western Conference champs before being released following last night’s win over the Brooklyn Nets. He played just two minutes in that one but scored four points and added one rebound and one assist. 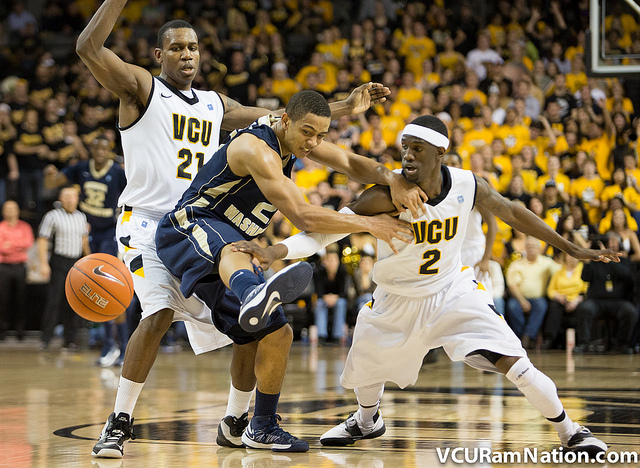 Weber and Graham joined VCU as members of the Rams’ first post-Final 4 recruiting class and graduated as legends together in 2015. Weber saw limited playing time on the Warriors stacked roster, averaging 6.6 minutes with Golden State and scoring 1.7 points per game. He’ll reunite with VCU great Treveon Graham who’s averaging just 1.4 points in 5.9 minutes per game in Charlotte. Charlotte showed interest in Weber following an explosive D-League season with Miami Heat affiliate Souix Falls before Weber opted for an NBA contract in Golden State. The Hornets become Weber’s fourth NBA team of his brief pro career, joining Miami, Memphis and Golden State in growing jersey collection since breaking into the league last season. Weber and Graham last played together on VCU’s 2015 A-10 tournament champion team, a team that saw Weber’s college career end prematurely via an ACL tear that sidelined him with 10 regular season games left to play. Weber was just 12 steals shy of the all-time NCAA steals record before he went down. Graham would go on to lead that team to VCU’s fifth consecutive NCAA appearance before falling to Ohio State in a round of 64 overtime defeat. Is it known anywhere what he gets paid for the stints?